Digital marketing success: Do you have the one thing? Search Engine Guide > Mike Moran > Digital marketing success: Do you have the one thing? Here at Search Engine Guide, we talk a lot about search engine marketing (no, really!) but we don't have our heads in the sand. Search marketing only matters in the context of succeeding in your overall digital marketing. So we spend lots of time discussing social media, conversions, and lots of other things related to search marketing. And all of those topics were on my mind yesterday when I taught a class yesterday at Rutgers University as part of the Mini-MBA in digital marketing. I have taught this class several times and I always enjoy it because of the interesting students I meet. Because my class is the introductory one in the course, it covers all of digital marketing, which makes me focus the students on "the one thing," which was Curly's law from the movie City Slickers. It probably doesn't have the same impact when I say it as when Jack Palance said it. I am not as tough as Jack Palance. (And that is taking into account that he has been dead for five years.) 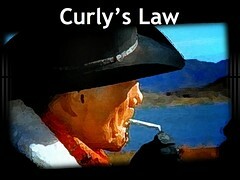 But Curly's advice matters. He said to do one thing. Just one thing. Which elicited the question from Mitch (Billy Crystal's character) as to what the one thing was. In the movie, Mitch had to figure out what the one thing was for him. For digital marketing success, I'll make it easier for you. I'll tell you. Persistence. Just flat-out stubborn stick-to-itiveness. Don't give up. Ever. That might sound like odd advice. I mean, after all, don't you need smarts and skills and experience and lots of other qualities? I admit that they all help, but none of them are the one thing. The one thing is to keep at it. The thing about all digital marketing is that it is direct marketing, done right. So the most important thing is to try again. You'll never have it perfect. It might never even feel acceptable to you. You might always feel like others are doing it better. You might sometimes think you'll never succeed. You need to take that attitude with digital marketing. You can't get out. You can't stop. You have to somehow make the best of it. Are there some people that just should not be digital marketers? Probably. But I think that many more people who could succeed give up when they just need to dig a little deeper. If you never give up, you'll pick up everything else you need. You'll learn what you need to learn. You'll make decisions based on results. You'll adjust what you are doing all the time. Whatever you need to understand or get done will somehow happen, all because you are not giving yourself any alternative. Try it for a week and see if it feels different. Instead of working on it for a while and then stopping out of frustration because nothing is improving, you can't stop. You have to keep going. If you don't give up, you will figure out a way. How do you find keywords in a specialized industry? How do you leverage social media for SEO? Well Sir you are absolutely right.I think luck is a important factor in digital marketing.You know ,you need to do a work at right time and in a right place. Sometimes no responses are really disappointing .But you have to try it again because failure is the pillar of success. I am also a firm believer in Persistence as the key to success not only in Digital Marketing, but regarding most things in life. Great post! I think that persistence is the key to Internet marketing in general. Everyday the Internet is expanding and evolving. You can't stop pushing because if you do, you'll get lost in the shuffle. You have to keep at it in order to stay afloat! Its a never ending road. You just have to keep at it. Nothing happens over night. It took me about a year before I started to make any money from internet marketing. Persistence is definitely the key and you also need to have patience in abundance as there is a lot of misinformation out there as to what works and doesn't. It takes time to sift through it all and to try new methods etc. I started my kayak site back in 2009 and tend to agree that there is a plethora of garbage information out there that in my eyes it tends to really hurt our community and actually make some of us hard working internet marketers look bad. With that said if you give your customers 110% every day, they will love you for it. I am honest and upfront with my clients and it pays. You have to work hard to gain trust and put in your due time, but know that hard work pays off in the end. What is necessary here to maximize your internet marketing strategy is to use SEO or search engine optimization techniques to build better network. The aim to be on top of search results is hard but with proper techniques or methods used, it will bring you there in no time.